Comparison the Analgesic Effects of Lidocaine, Xylazine and their Combination Used into the Epidural Space rn Rabbits. Marjani, M., Tavakoli, A., Tavakoli, J. (2014). Comparison the Analgesic Effects of Lidocaine, Xylazine and their Combination Used into the Epidural Space rn Rabbits.. Iranian Journal of Veterinary Surgery, 09(1), 17-22. Mehdi Marjani; Azin Tavakoli; Jafar Tavakoli. "Comparison the Analgesic Effects of Lidocaine, Xylazine and their Combination Used into the Epidural Space rn Rabbits.". 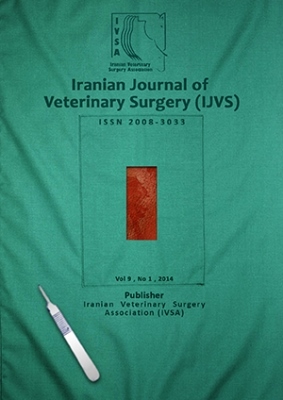 Iranian Journal of Veterinary Surgery, 09, 1, 2014, 17-22. Marjani, M., Tavakoli, A., Tavakoli, J. (2014). 'Comparison the Analgesic Effects of Lidocaine, Xylazine and their Combination Used into the Epidural Space rn Rabbits. ', Iranian Journal of Veterinary Surgery, 09(1), pp. 17-22. Marjani, M., Tavakoli, A., Tavakoli, J. Comparison the Analgesic Effects of Lidocaine, Xylazine and their Combination Used into the Epidural Space rn Rabbits.. Iranian Journal of Veterinary Surgery, 2014; 09(1): 17-22. Objective: Addition of the drugs to lidocaine to induce epidural analgesia in order to elongate and enhance the analgesia has been investigated previously. The objective of this study was to compare the effects of epidurally administered xylazine either in combination of lidocaine or alone in rabbits. Design: Experimental study Animals: Twelve healthy and adult male New Zealand white strain rabbits weighting 2.2±0.3 kg were used in this study. Methods: Following the epidural catheterization of all rabbits under general anesthesia they were randomly assigned to three equal groups of A, B and C. The next day administration of 4 mg/kg of 2% lidocaine, 3 mg/kg of 2% xylazine and 2 mg/kg of 2% lidocaine-1.5 mg/kg of 2% xylazine mixture was performed in group A, B and C respectively through the epidural catheter. The motor activity, the onset time of blockade, the duration of blockade, heart rate, respiratory rate and rectal temperature were recorded prior and during analgesia. Results: Values were not significantly different among the three groups (P>0.05) and no complication occurred during a week after induction of epidural analgesia. Either of the alone drugs or their combination is safe to be used into the epidural space in rabbits. Clinical Relevance: By considering the reduced dose of xylazine, the combination of xylazine and lidocaine seems superior to induce epidural analgesia in rabbits.